When will we know the Kirklees election results? 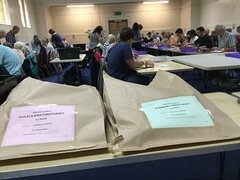 Election staff in Kirklees began verifying votes on Thursday evening. 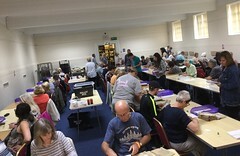 The counting will start at 9.30am on Friday 6th May. We talked to David Smith about the timetable for counting the votes in the local elections and PCC elections. He also explained the different stages of counting the votes for the PCC. After seeing the ballot boxes go out on Wednesday afternoon, we’ve now also seen them arriving at Cathedral House after the polls closed. Jayne’s ballot box is in this pile somewhere!